Still in her early 20s, this Tennessee native has worked with a number of major labels since she was a teenager. Possessing an unusually expressive voice, Barnett was the star of an Opryland tribute to Patsy Cline, whom she can uncannily sound like at times. 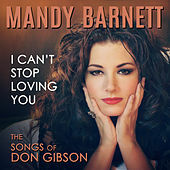 She infuses country songs with a sensual torchiness, giving material by top-notch writers such as Jim Lauderdale and Kostas the feel of classic pop standards.